$50.00 Air Force Colonel General Goryunov, Commander of 17th Air Army, typed document signed and dated 30 November 1947. Evaluation of an officer who had only civilian pilot training prior to the war but subsequently flew ten missions to supply partisans that required landing behind enemy lines! 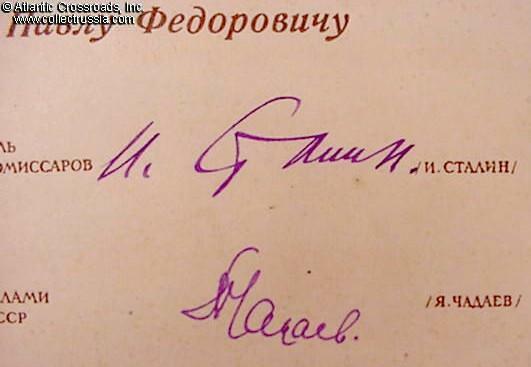 $70.00 Marshal of the Soviet Union Kirill Moskalenko, typed document signed on 30 June 1944 when Colonel General and commander of the famed 38th Army. Also signed on the same day by his Chief of Staff, Maj. Gen. Aleksei Yepishev - future General of the Army and Commander of the all-powerful Armed Forces Political Department. The document is a recommendation for promotion of a heroic antitank artillery major.